Northwest Bach Festival artistic director Zuill Bailey plays the unaccompanied Bach Cello Suites during last week's free Bach Lunch event at the Kress Gallery. Yup, that's a cut out of Zuill Bailey. 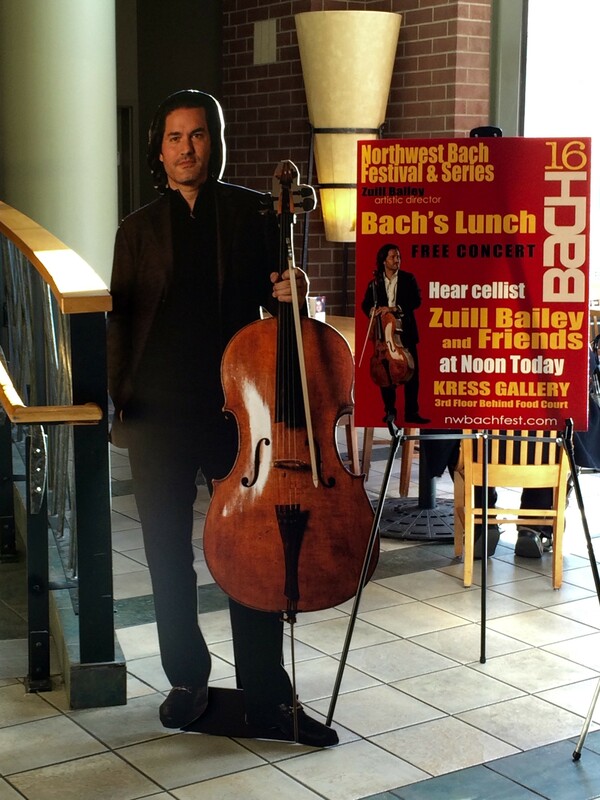 nt is also continuing through the weekend, the Northwest Bach Festival. And today at noon, in the Kress Gallery behind the food court at River Park Square, you'll get to combine the wonders of eating food (sack lunch or food court, your choice) with listening to some of the best professional classical musicians around at Bach's Lunch No. 2. Best of all, the event is free and open to everyone. Last week, we hit up the first Bach's Lunch performance, where festival artistic director Zuill Bailey enthralled with an hour-long session playing through the first three Bach Cello Suites along with fielding questions from the audience — yes, he answered last week, he does buy a seat for his cello while traveling via plane, and his cello is so old, it was around when Bach was alive. This week's performance is slated to include trio music played by Kurt Nikkanen on violin, Scott Rawls on viola and Zuill Bailey on cello, but the exact program will be announced at the concert. For those that missed the lunch concert the first time around, understand it is a much more freeing type of show than what one might experience in a concert hall. While most listeners do dutifully sit quietly, noises from the outside mall seep into the performance. Children in the audience rustle in their chairs. People are munching on sandwiches and chow mein and rummaging through sack lunches.There isn't the pressure to sit through the entire performance. But, for those that do, near perfection is on display. Bailey has played the Cello Suites since he was a child and he knows them so intimately he could sing them to you on the spot. His playing effectively cuts through the noise of the outside world to bring you to an intimate experience of world-class classical music played in a mall art gallery, which somehow has some of best acoustics around. Today's performance should be no different. Here's the lowdown for the rest of the week Bach Festival events. Friday will see the continuation of the Flash Bach series, where Bailey shows up anywhere in the city to perform an impromptu free concert. The exact location, however, will be announced on the festival's Facebook page tomorrow. 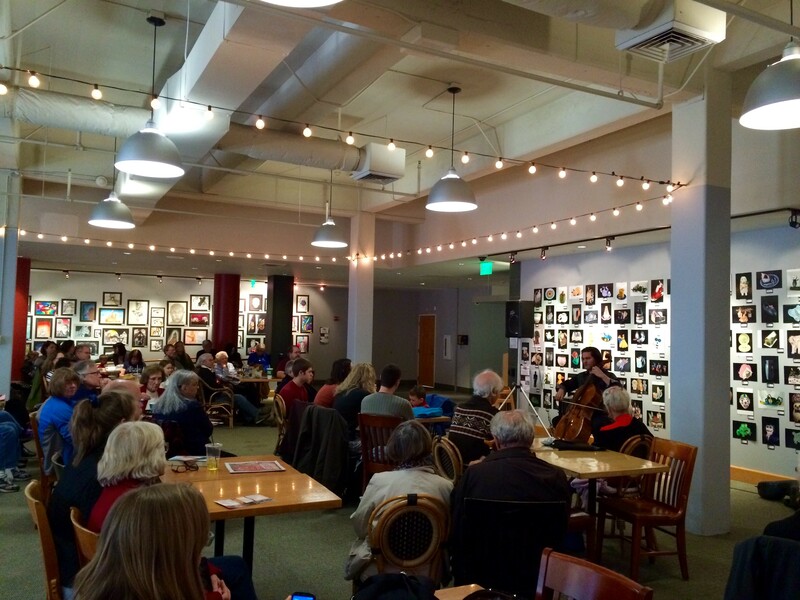 Friday night and Saturday’s events include Bach and Beethoven string trio concerts. The festival culminates Sunday at St. John’s Cathedral with the Bach Festival Orchestra performing, along with the same crew from the Bach Lunch, Kurt Nikkanen on violin, Scott Rawls on viola and Bailey on cello. The finale begins at 3 pm; tickets are $23-$45. Check out the details for the finale after party, a brand new event this year, at Overbluff Cellars here.